The Food Alphabet and More: Circles buffet for only P1,280 nett!!! 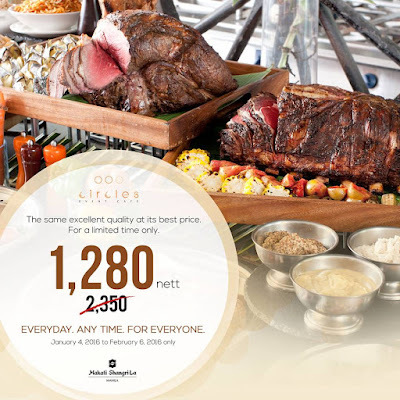 Circles buffet for only P1,280 nett!!! What a way to start the new year! Don't hesitate just enjoy! Be the first few to indulge in the celebrated international buffet of #CirclesEventCafe for a limited price of 1,280 nett! No frills, just good tasting food! Offer is available from today up to Feb. 6, 2016 only! Everyday lunch or dinner, even on weekends! So what are you waiting for? Book a table now, please visit: bit.ly/makatishangbookatable, or call restaurant reservations at (632) 8142-580 or email rric.slm@shangri-la.com. Excellent articles!i had shared it.